The first step to successfully monetize your patents is to contact PPI to discuss your patent and a plan for monetizing it. We will provide a free, preliminary and candid analysis of your particular assets and their expected market value. Patents are complex assets. Their value stems from a combination of legal, business, and technology factors. Assessing the value a patent thus relies on a combination of all three skill sets. In addition, the value of a patent ultimately lies with circumstantial factors such as the state of a patent war related to the asset and with who holds it; selling a patent then becomes an arbitrage of patent value from a prior owner to a new owner who values the asset more. No two assets are the same. While most of the time is spent studying the claims and related products, we also investigate the market of current and potentially future related products, review developments in related patent wars and keep apprised of even non-public inter-company disputes, and collect data on trends in the IP Sale community. We possess the necessary business acumen and wield wide technical experience to understand future technology trends in every tech market. 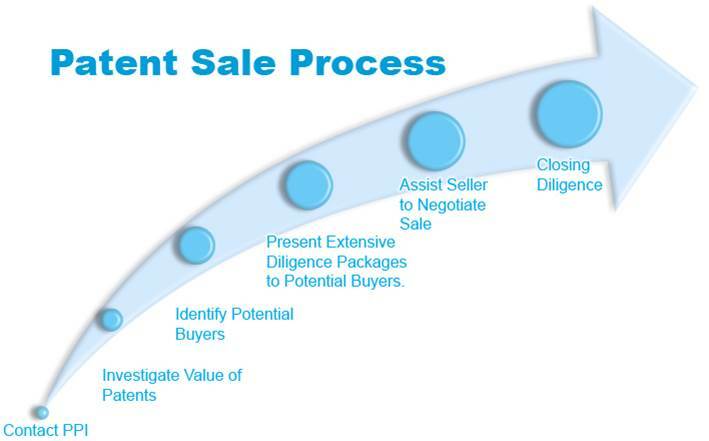 PPI performs a detailed process with all these considerations in mind to understand asset value and increase sale prices for each sell-side client and sale. If we engage with a client, then the Diligence Team spends weeks investigating the value of the assets, which is not always intuitive. We perform a detailed analysis and usually create a compelling sales package that conveys the unique value proposition of the portfolio being sold. The sales package typically includes Evidence of Use that demonstrates the high quality of the claims. These packages may take hundreds of hours to prepare. This marketing package includes the information Buyers need to make an informed and timely decision. We then ensure that the right Buyers review your IP. The ideal buying candidates for a portfolio are not often straightforward. Companies seeking counter assertion assets in a non-public dispute commonly buy outside of their technology product space, and usually pay top dollar. Investors reviewing an asset also have unique motivations that vary widely. PPI has direct access to, and maintains strong relationships with, the executives in charge of purchasing Intellectual Property at the leading technology companies and patent investors worldwide. We personally sell to the assets to those Buyers based on the unique value of the asset to each individual Buyer. Companies looking to fill gaps in a portfolio purchase differently than an investor aiming to recap an initial investment. PPI approaches each Buyer according to its specific needs, listens to those needs, and services them when patent owners have a need that fulfills a Buyer’s shopping list. Our presence in Silicon Valley allows us to meet with the Patent Buyers on a daily basis. The top patent buyers are here, or come to the Valley frequently and meet with us. PPI advocates on behalf of its clients and negotiates to secure the best possible sale price and terms for the seller. We have negotiated countless Patent Purchase Agreements and know how to navigate the pitfalls and deadlocks. There is no celebrating at the five yard line. We drive hard to close the deal and leave little to chance. Our goal in Closing is the transfer of clean title for cash. We simplify the sales process with no ongoing fees; we are only paid after the patent owner receives money for the sale.